Gastric cancer (GC) is one of the most aggressive malignancies and has a poor prognosis. Identifying novel diagnostic and prognostic markers is of great importance for the management and treatment of GC. 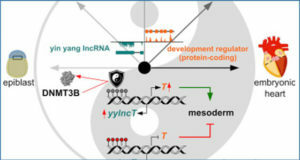 Long non-coding RNAs (lncRNAs), which are involved in multiple processes during the development and progression of cancer, may act as potential biomarkers of GC. 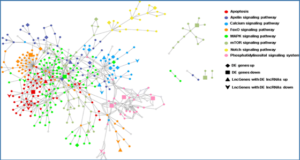 Here, by performing data mining using four microarray data sets of GC downloaded from the Gene Expression Omnibus (GEO) database with different classifiers and risk score analyses, researchers at the Shanghai Jiao Tong University School of Medicine were able to identify a five-lncRNA signature (AK001094, AK024171, AK093735, BC003519 and NR_003573) displaying both diagnostic and prognostic values for GC. 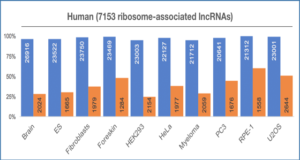 The results of the Kaplan-Meier survival analysis and log-rank test showed that the risk score based on this five-lncRNA signature was closely associated with overall survival time (p = 0.0001). Further analysis revealed that the risk score is an independent predictor of prognosis. 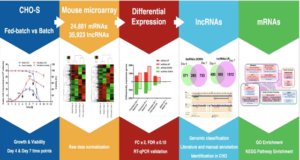 Quantitative reverse transcription polymerase chain reaction (qRT-PCR) analysis of 30 pairs of GC tissue samples confirmed that the five lncRNAs were dysregulated in GC, and receiver operating characteristic (ROC) curves showed the high diagnostic ability of combining the five lncRNAs, with an area under the curve (AUC) of 0.95 ± 0.025. 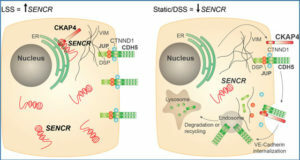 The five lncRNAs involved in several cancer-related pathways were identified using gene set enrichment analysis (GSEA). 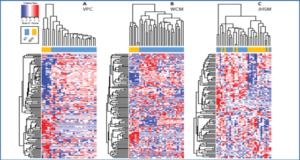 These findings indicate that the five-lncRNA signature may have a good clinical applicability for determining the diagnosis and predicting the prognosis of GC.